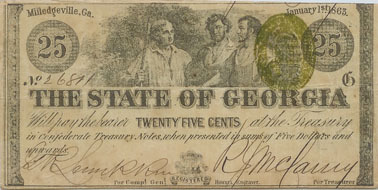 The State of Alabama will pay to bearer in Confederate States Treasury Notes when presented at State Treasury in sums twenty dollars and upwards. Center venette is a wagon load of cotton. Center venette is a tree with a map. 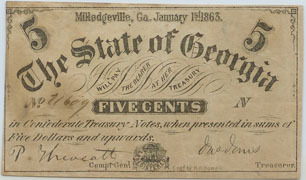 The State of Georgia Bearer at her treasurer in Confederate Treasury Notes when presented in sums of 5-dollars and upwards. 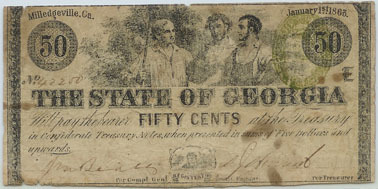 The State of Georgia will pay the bearer at the Treasury in Confederate notes when presented in sums of 5-dollars and upwards. Center venette is three workmen. The State of Georgia will pay the bearer redemable in 8 per cent state bonds or specie 6-months after a treaty of peace or when the banks of Savanna and Augusta resume specie payment if before that time. 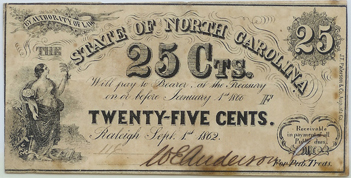 The State of Georgia will pay the bearer at her treasurer on the 25th day of December next, in Confederate Treasury notes issued after the first of April of 1864 if presented within three months after maturity, otherwise not redemable except in payment of public dues. Receivable for all dues to the state and for public lands 12 months a definitive treaty of peace between the Confederate States and the United States. This note is printed on the back of a Texas three pesos and two pesos note. The State of Louisiana will pay to bearer 12 months after a definitive treaty of peace between the Confederate States and the United States at the Treasurers office. The back is defined as an ornate green back. 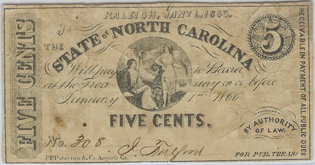 The State of North Carolina will pay to bearer at the Treasury on or before January 1, 1866. Center venette is Liberty and Peace within a circle. The Bank of the State of South Carolina will pay to bearer on demand "in current funds". 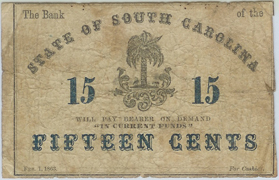 Unlike other Southern States that issued their own currency to finance civil war needs, South Carolina used a more conventional and conservative approach. It relied on taxes and bonds of which the bank of the State of South Carolina was the agent. Center venette is palmetto tree. The State of Mississippi to bearer the sum of one dollar of proceeds of cotton pledged for redemption of this note, at the Treasury office in Jackson Mississippi. 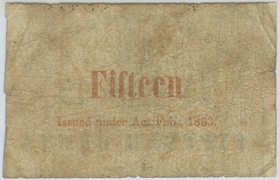 This issue of note resulted from the demands of te cotton planters that stored cotton be pledged for the eventual redemption of the currency. Left venette is commerce, the center is a train, right is a fanner with wheat. The Common Wealth of Virgina will pay to bearer on demand at the Treasury. 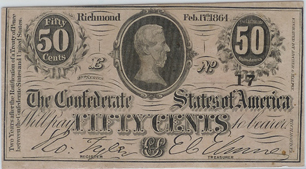 Printed by Hoyer and Ludwig in Richmond, VA.
Left venette is Gov. John Letcher, the center is a milk maid seated. Fundable in eight per cent stock or bond of the Confederate States 6 months after the ratification of a treaty of peace between the United States receivable in payment of all dues except export duty. Engraved by Col. Blanton Duncan, Columbia, SC. The Confederate States of America will pay to bearer 6 months after the ratification of a treaty of peace between the Confederate States and the United States receivable in payment of all dues except export duty. Engraved by Hoyer and Ludwig in Richmond, VA.
Left venette is Sailor leanin on a capstand, the center venette is a three masted sailing ship. The Confederate States of America will pay to bearer 6 months after the ratification of a treaty of peace between the Confederate States and the United States fundable in stock and bonds of the Confederate States receivable in payment of all dues except export duty. Engraved by Keatinge and Ball Columbia SC. Center venette is Capital of Confederate States (Virgina State Capital, Richmond VA), the right venette is C. G. Memminger, Confederate Treasury Secretary. The Confederate States of America will pay to bearer on demand 6 months after the ratification of a treaty of peace between the Confederate States and the United States receivable in payment of all dues except export duty. Engraved by Keatinge and Ball, Columbia SC. Center venette is Clement Comer Clay, Confederate Senator of Alabama. Center venette South Carolina State Capital Columbis SC. Right venette is Robert.T. Hunter, Confederate Secretary of War. The Confederate States of America will pay to bearer 2 years after the ratification of a treaty of peace between the Confederate States and the United States. Engraved by Archer and Halpin, Richard VA.
C. G. Memminger, Confederate Treasury Secretary. Center Vinette is horses pulling a cannon. Right venette is Robert.T. Hunter, Confederate Secretary of War. Center venette Tennessee State Capital, Nashville, TN. Right venette is Alexander H. Stephens, Vice President of the Confederacy. Center venette Jefferson Davis, President of the Confederacy. Left venette is sailing ship. Center botttom venette is a bee hive.